Sarah is the director of Alley Bell Music. She teaches Music Together® Mixed Ages, K-2 Music Fundamentals and Private Voice. She earned a B.M. in Music Education from Western Washington University, and an M.M. in Voice Pedagogy from Texas Christian University. It was during her time at TCU that she was introduced to Music Together. She received her Music Together Teacher training in 2011 and her Level 1 Teacher Certification in 2017 from the co-author of Music Together, Lili Levinowitz. 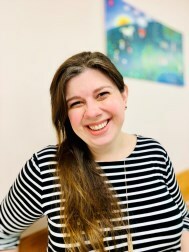 Sarah has over ten years of experience teaching K-6 General Music for the Edmonds and Shoreline school districts, and has been teaching private voice for over 15 years. She is registered as a Community Based Instructor with the Quilcene School District’s P.E.A.R.L. Program, a homeschool learning program for K-8 students in Washington state. Prior to starting Alley Bell Music, Sarah was also on the music faculty at Shoreline Community College. Sarah performs locally as a professional soprano soloist, and is a member of the local and national chapters of the National Association of Teachers of Singing. In addition to singing and teaching, Sarah also has a strong background in dance, and enjoys sharing her love of creative movement in her classes. She likes to joke that her life is filled with beautiful noise in and out of the classroom, as she is also the mother of two boisterous young boys, Josiah and Jamison. Elizabeth is originally from Orlando, Florida & has been living in the Pacific Northwest since 2015. She teaches Music Together Mixed Ages and Music Together con Español. She earned her B.M. in Vocal Performance at Stetson University & her M.M. at the University of Michigan School of Music Theatre and Dance. She completed her Music Together Teacher Training in October, 2018. In addition to teaching classes at Alley Bell Music, Elizabeth is a professional lyric mezzo-soprano and a private voice teacher. Recent performance highlights include Anita in West Side Story with Symphony Tacoma & Hansel in Hansel and Gretel with Northwest Opera in Schools, Etc. (N.O.I.S.E). Along with her solo work, Elizabeth is a member of the Seattle Opera Chorus, a worship leader at Cornerstone Christian Fellowship Church, and a volunteer for YoungLife Bellevue. Elizabeth has always loved music and children, so when her friend introduced her to Music Together, she knew she needed to be a part of the magic. Elizabeth is fluent in Spanish and has a black belt in Karate. She is thrilled to be teaching at Alley Bell Music! Mariah is thrilled to be teaching at Alley Bell Music! She teaches Music Together Mixed Ages, including our popular evening pajamas class. Mariah earned a BA in Music from Western Washington University, and completed her Music Together Teacher Training in April 2018. After finishing college, Mariah performed in many musical theatre productions in local Seattle theaters before moving to New York City in 2006. In New York she sang with an accomplished singer/songwriter all around Manhattan and just generally loved living there. Mariah also occasionally performs in the greater Seattle area with the chamber group, Vestr Singers, which is made up of a group of musicians she worked with at WWU, coincidentally, all of whom happen to be college friends of Alley Bell Music Director, Sarah Richàrd’s too! Mariah is Mom to twin 7-year-old girls, and she spends a lot of time volunteering at their school and leading their Girl Scout troop when not singing and dancing with all of you! Alley Bell Music is pleased to welcome Lissy Waring as an apprenticing teacher this spring! Lissy attends classes with her daughter Evy at our Edmonds studio, and completed the Music Together Teacher training in March. She earned her BA from Covenant College in Chattanooga, TN with a mixed degree in Music, Theatre, and Psychology. Previously, Lissy has performed in several musicals, worked as a solo vocalist, sung in choirs, taught music with signs to toddlers, did drama therapy with at risk youth, and even co-wrote and directed a musical with her husband. She has a deep love of sharing the arts with all ages, especially her daughter Evy. Lissy and her husband are currently planning a move to Denmark for the summer. If the move becomes permanent, she will be exploring the possibility of opening a Music Together Center abroad!